It’s a funny story, actually. Since we have a gas stove, we needed the gas fixed and turned back on in order to feed the 30 people that were in our home. The food was supposed to go on the stove at 5:50. At 5:48, we got the gas turned back on. That, my friends, is a success story! 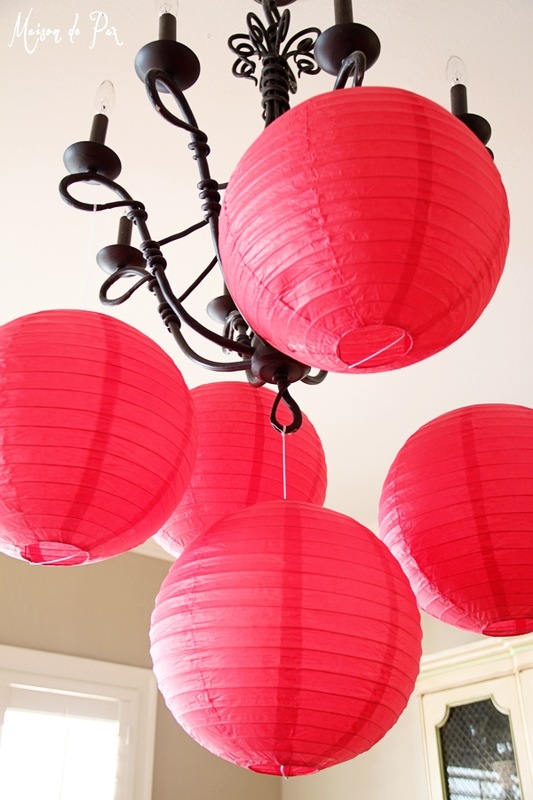 These paper lanterns were only $17 for 10. 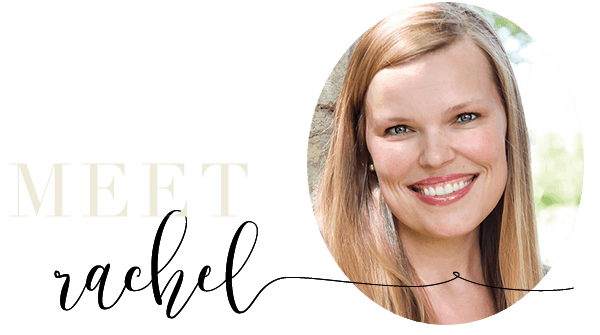 I hung three in the entryway, five from the chandelier in the dining room, and two outside on the porch. It was EASY (seriously, it took about 10 minutes, and my boys thought it was so fun! ), and no one could miss the effect. 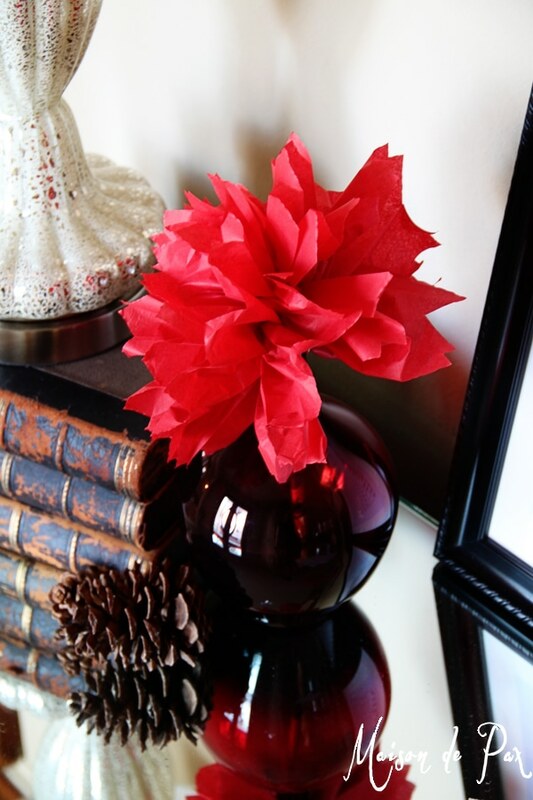 I spent 10 minutes (and $1.24 on a package of red tissue paper) making some pom pom flowers. 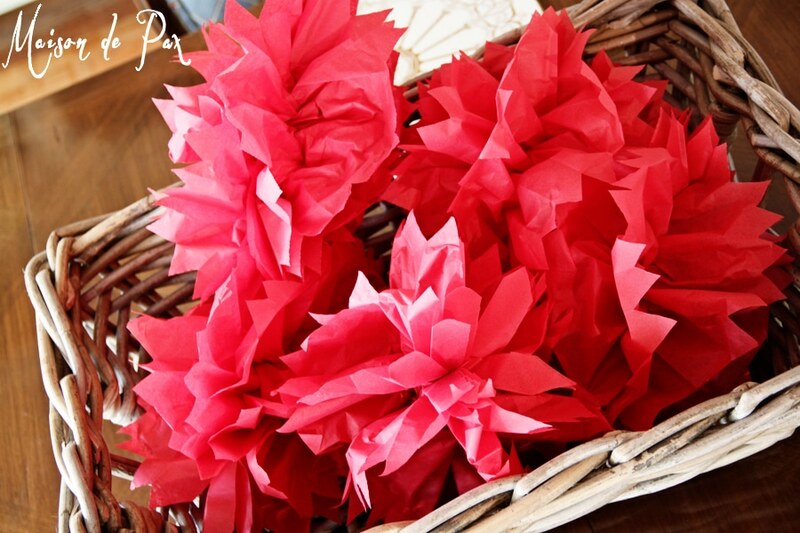 I piled most of them in a basket on my table, making a huge, red, textured centerpiece. And I added a lone one on the entry table for some continuity and color. In this case, I opted for the entryway (first impressions, anyone? ), the dining room (though obviously everyone did not fit in there, it was a dinner party, after all! ), the back porch (where we have another big dining table) and the drink bar (more on that to come next). I could have worked much harder to scatter decorations throughout, but by limiting myself to these few areas, I was able to make less (time saver!) and concentrate the decorations I did have for greater impact. 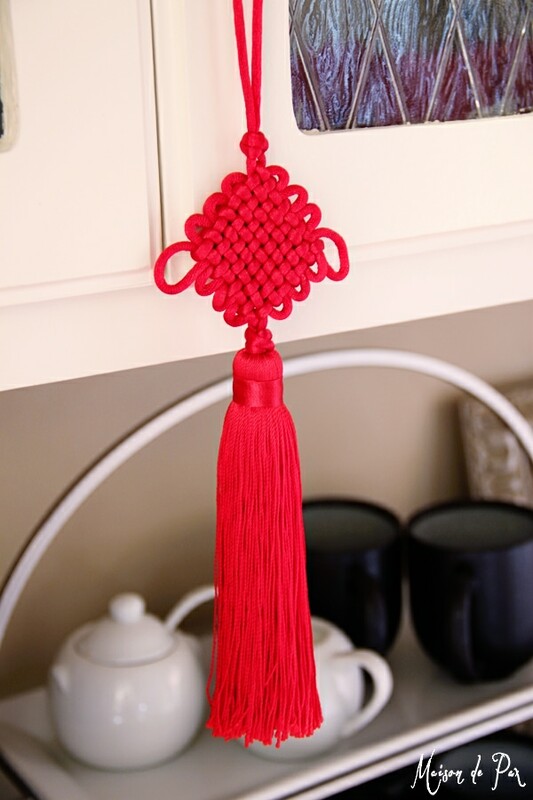 I was given these beautiful tassles from China by my international student, and I wanted to use them, but they are a little small to make much of an impact. So I hung them at eye level, right over the drink bar. They were prominent enough to earn comments (and to show my student how special they were to me! ), and they livened up an otherwise functional party space. I was also given these gorgeous cut-paper bookmarks representing the 12 animal signs. 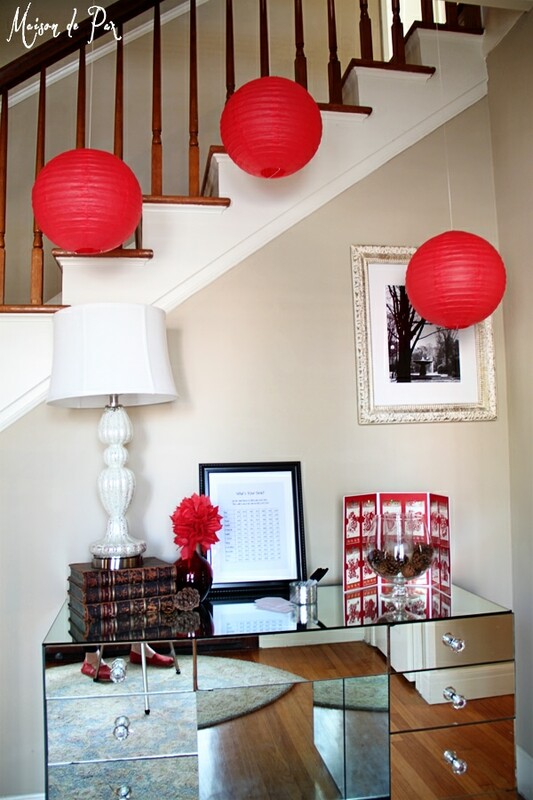 I used them right on the entry table to add color and authenticity to my otherwise rather American red decorations. So… how about a few more directed tips? 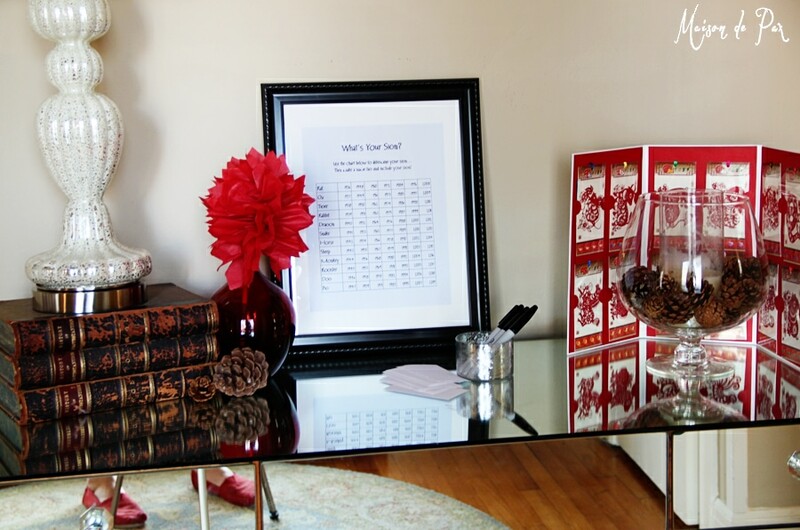 These tips have helped me for numerous parties to make a big impact with little time and money. 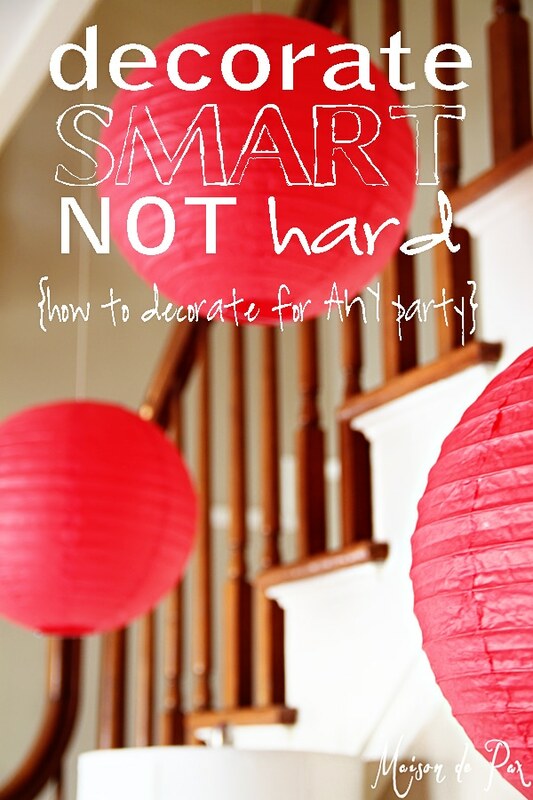 Do you have any other great tips for low-cost, low-effort party decorating? 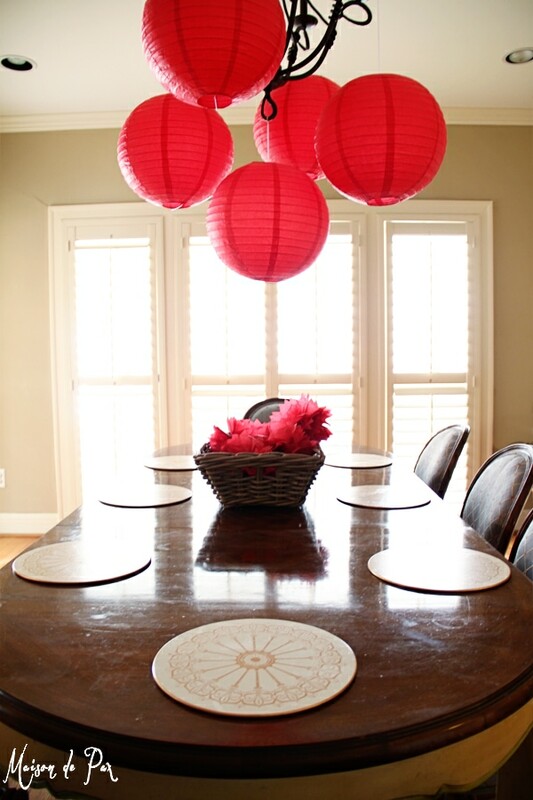 I love the idea of having a theme (color or otherwise), sometimes it can be overwhelming trying to plan a party, think of creative foods, clean the house and decorate. These are AWESOME tips! Visiting from the party at the diy dreamer! Thank you so much, Shelley! Glad to know I’m not the only one who experiences crazy days like that!! 😉 So glad you stopped by; hope to see you again! 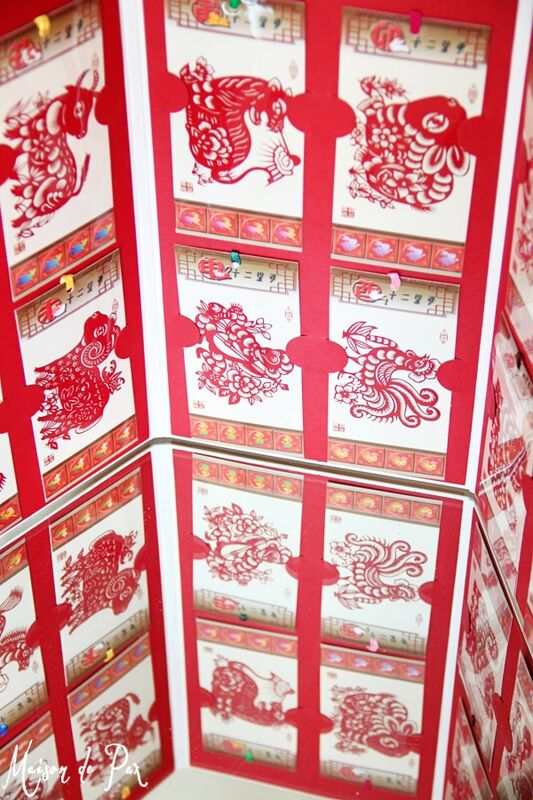 Great tips, I like the idea of just decorating dedicated spaces (on the cheap or handmade too). Keeps it less from being overwhelming. Thanks, Sarah. So glad you liked the ideas!